I have a new favorite pizza topping. Actually, two new favorites, although one of them is hard to come by. Remember the quinoa greens? This is a pizza I made with quinoa greens, scallions (my new favorite pizza topping), garlic and tomatoes. 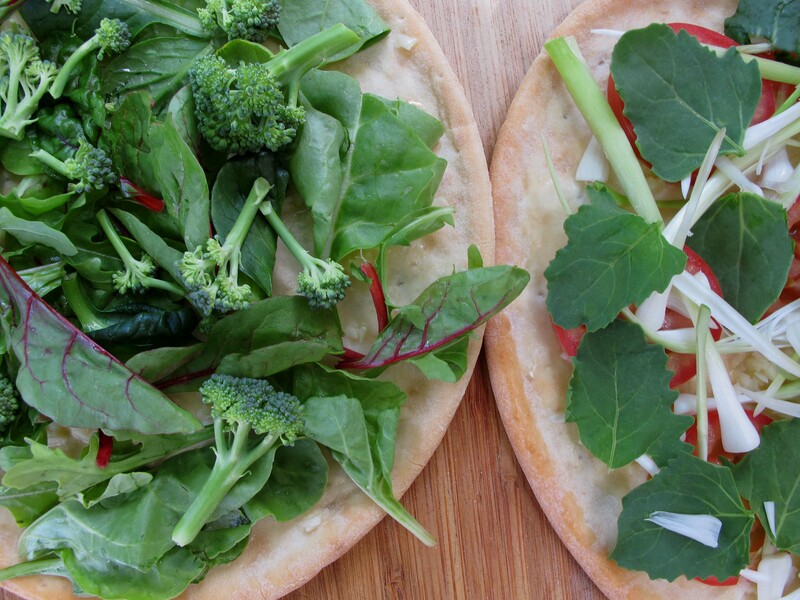 If you’ve been following this blog for any length of time, you’ll know I like thin crust, gluten-free pizza, but I like it with fresh, wholesome vegetables and I don’t like tomato sauce. The thinner the crust, the better. Less “bready” calories and I like the crunchy texture of cracker-thin crusts. But you must try pizza with scallions cut the long way and spread out on the crust. They’re over-the-top delicious. Seriously good. The quinoa greens are wonderful as well, but after two deliveries to my local organic market, they’ve disappeared. Half of the ingredients in these before photos came from my Grant Family Farms CSA veggie share. I’ve been getting the most amazing organic scallions, broccoli, spinach, beets and fresh garlic lately (along with a lot of other nutrient-dense goodies). I used Udi’s Gluten-Free Pizza Crusts, brushed them lightly with olive oil and spread a bunch of chopped garlic over that. Organic, farm-fresh garlic is incredible, especially topped with fresh, sliced tomatoes. I washed the scallions, trimmed the ends (but left them fairly long) and then sliced them the long way. After spreading them over the crust, I topped that with the quinoa greens and a light sprinkling of raw cheddar cheese. I did exactly the same preparation with the other pizza crust (olive oil and fresh garlic), but topped it with broccoli, spinach, beet greens and a sprinkling of cheese. I baked them in a 375 degree oven for about 12 minutes. Divine! You might also like some of my other strange pizza combinations. beet pizza, red chile enchilada pizza, BBQ chicken and onion ring pizza, etc. 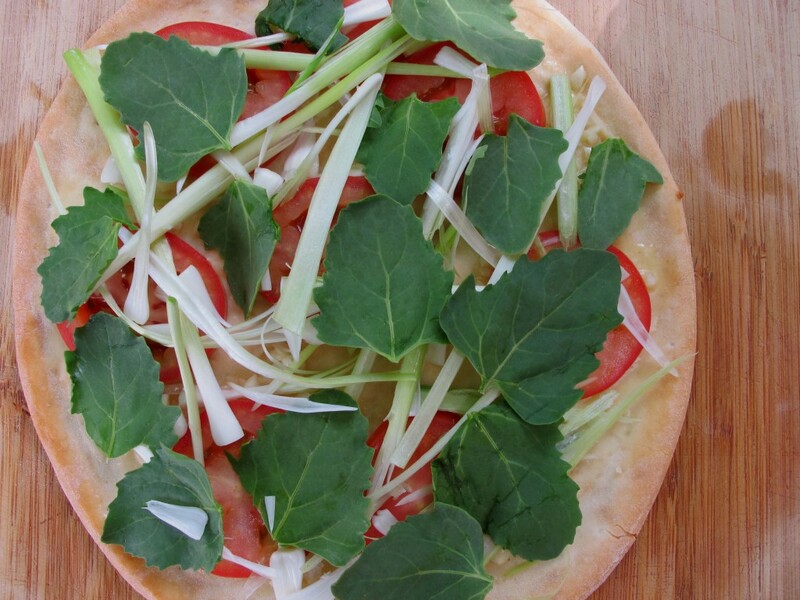 Peace, love and scallions on pizza! P.S. Do you call them scallions or green onions? This entry was posted on Friday, July 29th, 2011 at 1:21 pm	and is filed under Gluten-Free Recipes, Seasonal Foods. You can follow any responses to this entry through the RSS 2.0 feed. You can leave a response, or trackback from your own site. We call them Spring Onions here in Yorkshire…Can’t wait to try them on gf pizza! I totally agree. A no-sugar, whole grain, gluten free crust would be awesome. I’ve been doing this (living GF) for a very long time and pizza dough is a tricky one. I rarely eat processed foods, but this is my “go-to” treat on occasion. Like I said in the post, thin is better as you don’t eat as much of the dough (Udi’s are very thin). Then I top it with fresh, healthy ingredients. I don’t eat out much and I rarely eat sugar, so this is my treat. =) Plus, it’s so easy on a busy evening after you’ve had a long day. And they taste good. I’ll check around though and see if any of my blogger friends has a recipe for a sugar free, whole grain pizza crust. Thanks for your comment. Good one! Pizza is my favorite! I too do not like a bready-calorie-filled pizza. I make my own corn tortillas. I can buy little ones at the store, but I want a pizza bigger than the teeny tiny tortillas in the store. So, I picked up some corn flour and made my own 10″ tortillas (sometimes they may strecth to 12″ ‘by accident’ if I am really hungry). I make a bunch at a time and freeze them, then when I want a pizza. I put one on my pizza stone, top it and bake at 425 until it looks ‘perfect’! It’s the thinnest crust and yummiest pizza I have ever had. Even my non-GF family asks me to make these pizzas for them all the time! Your crusts sound amazing! You wouldn’t want to share the recipe with the rest of us, would you? Please, please. =) I’d love to figure out how to make a really healthy crust that also tasted good. It’s not easy, that’s for sure. I might have to play around with a corn tortilla recipe. Thanks for the tip-off and inspiration! And I love it when non-GF people love the recipes. Makes me smile. Would love to eat pizza with you, Melissa! Well, now we all know about quinoa greens … so interesting. Seems like there should be a mega post on all the possible greens out there! Oh, and congrats to Nadya! Your pizzas always amaze me. Yum! Same here Melissa. I was going to say the exact same thing…looks healthy! Haha, thanks for sharing! I like to use pesto on pizza (your garlic on olive oil sounds divine as well), & in the spring a favorite is to make nettle pesto! You could also do that with the quinoa greens – just whir them in a food processor with olive oil & garlic like you would for basil pesto – add nuts if you wish – or sunflower seeds, etc. My ‘Growing Wild’ farmers (http://growingwildfarm.com/) had Magentaspreen at the market again today, & Sheila told me I was right, that WAS what the fuscia tipped ‘green’ has been – I love that they try new plants! I have a CSA with other farmers, but enjoy the flexibility my ‘Medium Share’ allows. They were marketing them as ‘magenta spinach’ today, as spinach is a more recent relative … arugula is another fun green for pizza. I’ve never had nettles, although it’s been on my list to try. Nettle pesto sounds interesting. You’re so creative. I love fresh arugula on pizza, especially if I want to do a dairy free pizza. I put garlic and olive oil (or a very light, light brushing of a tomato sauce, followed by something simple, like sliced tomatoes or thinly sliced zucchini. I bake it, take it out and top it with a bunch of fresh arugula. It’s like a pizza salad. Very good. I’m going to have to try that magentaspreen. It’s so beautiful and I’m guessing the nutritional profile is over-the-top wonderful. Thanks so much for your comments, Nadya. You add so much to the conversation. Must go check out all the recipes you listed on my other post. Peace, love and mighty greens! Thanks, Nadya. I’m off to snoop around your blog! Tried a version with my GF teff/millet wrap – YUM!!! Harvested my garlic this month, so used SEVERAL cloves – mmmm. & green onions, garlic chives, heirloom tomatoes, magentaspreen, basil, tarragon, oregano, thyme …. Next time I won’t cut the wrap (admittedly quite ‘loaded’ with goodies) but just roll it – maybe cut it in half, but not in slices! I’m on a mission to find magentaspreen. Your wrap sounds delicious. Do you ever use collard greens for the wrap? That’s a favorite of mine. Quickly blanch to soften it up and use it as a roll. Yum, indeed!